Brands often find that their Facebook Page reach is declining. 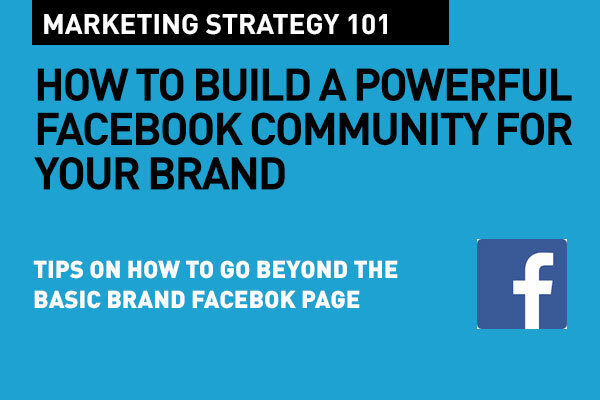 Building a powerful, engaging community for your Facebook fans is a far more consistent and friendly approach to connect with your fans and your target audiences. Your first step is to find out a lot more about your audience. This is what's going to empower how well you build your community. Building a proper community means you need to really put aside your "selling" hat. A community is about participation, a sense of belonging, and ultimately a benefit to the end user. Being consistent with what you provide for your community is key. And the big key here is content. Not about your product or service – but useful content that will resonate with your audience. Facebook Live let's you connect with your audience with streaming video that's delivered live – there and then – making the moment special and endearing. The great thing about Facebook Live is that it is truly a dialog, a shared experience rather than a one way broadcast. Your fans can ask you questions live, as you are streaming, and you can anser those live as well. It brings a really cool sense of intimacy and participation, if you do it right. Remember to make your Facebook Live cast friendly and ask for participation. As of now, you can stream Facebook Live from your Facebook Page or from a Fcebook Group (read more on Group below). To begin a Facebook Live broadcast from your mobile device, go to the status update box on your page or in your group. Among the options at the bottom, click Go Live (the one with the little red camera next to it). You are on! Plan every Live session carefully. Have a clear topic that will work with your audience – one that will genuinely interest them. Let your audience know that you will be going Live. Announce the date and time slot ahead. Post these on your regular page several times before the session. During the sesion, do ask for participation. When you respond to fan questoins while you are live gives a great sense of here and now, it's a dialog, a conversation. There's no better way to create a sense of trust between you (as a brand) and the audience. Prepare for questions ahead – you do want to look the part of authority. Remember that after the actual live broadcast, the video will be available on the page or group for good. There may be post-session questoins as well, and don't ignore those. Also, tell them when you'll be going Live again... This continuity, and consistency is what builds a sense of community. Essential Reading: How to use Facebook Live video like a pro. The essentials of getting it right. Many top brands are increasigly building Facebook Groups – because content shared with a group almost instantly resonates with the audience – it serves up to what the audience is really interested in, and it is far more engaging than your regular brand page. Groups are collections of like-minded people who share a common interest or goal. And, while a Group ideally should not be just about your brand product, you can certainly build a lot of interest around your product without overwhelming the audience. Your Group should be a place –yes, a community, where your audience can feel comfortable and have a sense of belonging. Facebook doesn’t limit who can see what. Members of a group can see all of the posts in it. 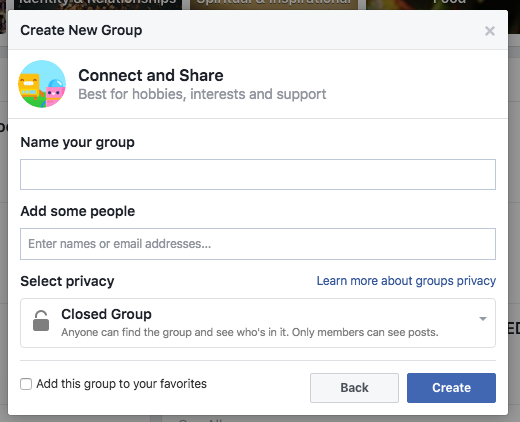 When you create a Facebook Group, you need to have good insight on what your audience would really be interested in. remember, our first step towards building a community was to gather customer and audience insights. To create a Facebook group, go to the Groups section in the left-hand sidebar and click Create Group on the top right side. 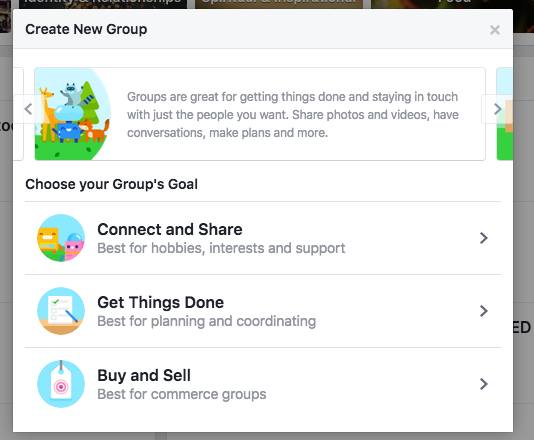 Facebook will ask you to choose the purpose of your group, click Connect and Share. That's the best option for a brand. Name your group – carefully choosing a name that every one will understand, and know what they'll get out of it. The name should be easy to find in Facebook Search. Start by inviting a few people to join. Add a cover image and a useful description. The cover image should be inviting and relevant to the purpose of the group you are creating. Remember, that you can create more than one group, although, if you haven't done one before for your brand, I'd recommend a bit of practice with just one to start with. Then, click "Add a Description" in the right-hand sidebar. In the description, let members know about your business, link to a business landing page or your homepage, and state what they can expect from joining your community. This is very important. Of course, you'll need to promote your Facebook group so members will join. Announce your Group wherever possible. Let your customers know via email. On social media, you can pin a tweet, boost Facebook posts, and or even share an Instagram pic about your group. You need to focus on engaging your audience within the Group. Start with posts that will trigger action. Your posts should get the conversation rolling so members can discuss the topic you posted amongst themselves – and even with you as a brand. Try asking people to share their favorite ways to use your product. Their favorite hacks. Their memorable moments. Share articles and news that will resonate with the core purpose of the Group. One cool idea for a Group is to provide a solution. What solutions does your brand or product provide? You can share articles from multiple sites that help your audience in their every day lives. Remember people join a Group because thay feel that they'll have a need resolved. Show off your expertise here. Gain a sense of trust by answering questions, providing tips and guiding your audience forward. 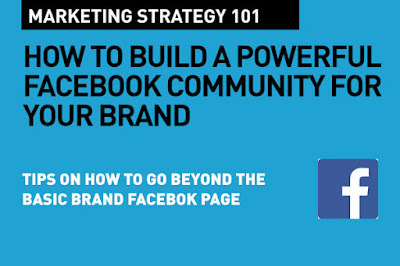 In conclusion, building a community is a far longer game than just a Facebook brand page. Your community will help you establish a unique platform in your industry and bring your brand a confident sense of authority as well as a tone of friendliness and conversation with a group of loyal fans. That's how you better engage than a page, because a community that works well, spreads itself. It will be a really interesting year ahead. There are going to be so many things to look forward to. I think the trends that will begin this year will set the tone for years to come. Building a community for Facebook fans is a priority, rather than just have a fan page, and this post makes all the points that we need to remember. Nice blog, thank you for sharing such great information. This is awesome post. The information you provide about Facebook audience is really nice. Almost all the people of the world have an account on Facebook. So Facebook marketing give you a great opportunity to reach your product to the huge amount of audience.